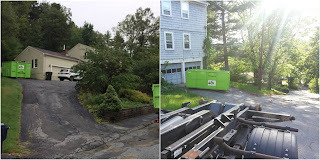 wachusettdumpsterrental: Question of the week: Does my driveway have to be completely flat for placement? Question of the week: Does my driveway have to be completely flat for placement? While driveways are an obvious choice for where most residential roll-off dumpsters are placed, there are however, some places your dumpster rental should just not go. It’s all fine and dandy to put an empty bin on a slope, but things can change quickly once you start loading it up with junk. As the dumpster takes on more and more weight from whatever you’re tossing in it, the potential of the dumpster sliding or skating down a slope increases. This is particularly important to keep in mind during winter, early spring, or late fall conditions when the threat of frost and freezing is present. A lot of our roofing customers have experienced skating on a steep driveway. Think about all the roofing materials and scrap getting tossed into a dumpster rental from the roof — that slamming and compacting action onto the bin actually can cause it to skate right down into the street. That said, sloped surfaces aren’t entirely off limits and getting a second opinion from your local Bin There Dump That franchise operator is a great idea. 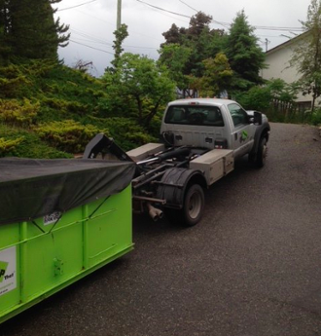 Thanks to our residentially-friendly roll-off dumpsters, our Delivery Experts are more than willing to work with your sloped driveway — positioning the dumpster in a secure and easily accessible location.